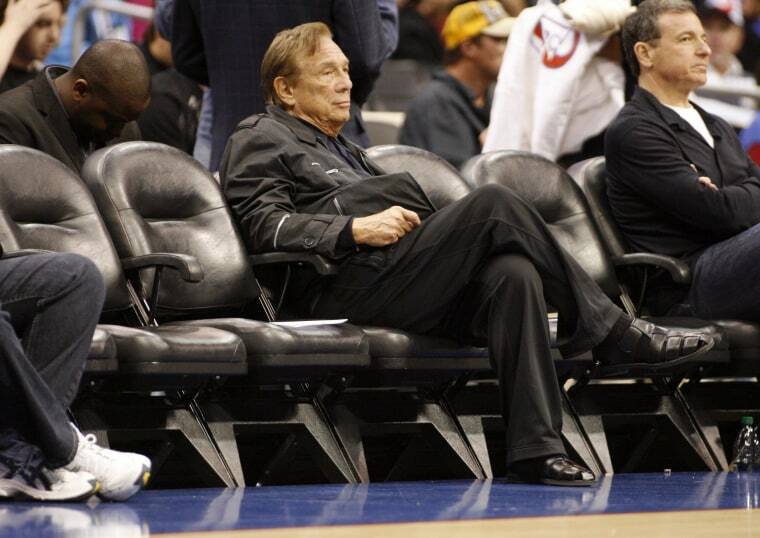 Donald Sterling in Purported New Recording: I'm Not a Racist! Donald Sterling wants his friends to know, he's no racist. In a newly released audio purported to be of a conversation between Sterling and someone close to him recorded last week, the ousted Los Angeles Clippers owner rails against the storm gathering around him. "You think I’m a racist?" Sterling asks the friend in the recording that was obtained and posted by RadarOnline on Thursday. "You think I have anything in the world but love for everybody? You don’t think that! You know I’m not a racist!" The other voice responds, "I know I, but, I but .. what about when I hear that tape though, that tape of her..."
"I grew up in East LA!," Sterling retorts. "East LA! You’d die to get out of there — I got out of East LA. I was the president of the high school there. I mean, and I’m a Jew! And 50 percent of the people there were black and 40 percent were Hispanic. You ever been to Boyle Heights (a working-class Mexican-American neighborhood in LA) ... So I mean, people must have a good feeling for me." The other man then asks if Sterling had talked to Clippers forward Blake Griffin (who is of mixed race) or anybody else on the team. "I didn’t talk to anybody, I'm in my house in Beverly Hills," Sterling says. Sterling, 80, also indicates that he's upset that Magic Johnson — who was the figure at the center of the racist comments he made to gal pal/personal assistant V. Stiviano and released by TMZ on April 25 — was so quick to publicly renounce him. "You can’t force someone to sell property in America!" "It breaks my heart that Magic Johnson, my — a guy that I respect so much, wouldn’t stand up and say, ‘Well let’s get the facts. Let’s get him and talk to him.’ Nobody tried. Nobody! I’m here on Beverly Drive and Sunset across from the Beverly Hills Hotel." NBC News could not independently confirm the authenticity of the tapes, but RadarOnline Editor-In-Chief Dylan Howard said that the source who recorded the conversation on May 1 — almost a week after the original recording was aired — had provided a sworn and notarized affidavit saying it was Sterling. On the recording, Sterling, who is being pushed by the NBA to relinquish control of the Clippers, also rages at the idea that he might be forced to sell the team, which has been valued at half a billion dollars. Sterling is banned for life from any association with the league or the Clippers, and has been fined $2.5 million — the maximum allowable under the NBA constitution. If three-fourths of the other 29 owners agree to Silver's recommendation, Sterling will be forced to sell the team he has owned since 1981. Meanwhile, his wife and co-owner of the team, Shelly Sterling, has vowed to maintain ownership. "Commissioner (Adam) Silver made it clear, that when he announced sanctions against Donald, that the NBA was taking no action against me or my family," Shelly Sterling said in a statement given to ESPN. Silver did in fact say last week that the ruling that Donald Sterling be banned from NBA operations for life "applies specifically to Donald Sterling and Donald Sterling's conduct only." When an NBC News reporter contacted the Sterlings at their Los Angeles home, Shelly simply said "We are not talking."